I plucked the above image from the Frontiers of Anthropology operated with Dale Drinnon. The text does push an expansive view of the Atlantean world that is a little over the top when the data conforms well with a pretty exciting story in the event. The maps however are very important and it is data that I have been waiting for. Recall that I have recently posted that the upsurge of the Hudson Bay region, resulting from the collapse of the Great Ice Age had the natural consequence of allowing for an equivalent crustal decline. I observed that the easiest region to experience a decline would surely be the Trans Atlantic Ridge. The most obvious candidate would have to be the Lyonese land mass, much larger than Great Britain and just West of it and fully submerged. This left open the question of further subsidence along the ridge between Lyonese and the equator. This obviously opened the door for the Atlantean legend itself. Yet we had no data. Now we have the above. Essentially a mountainous ring is shown and apparently on better images we have a central cone. 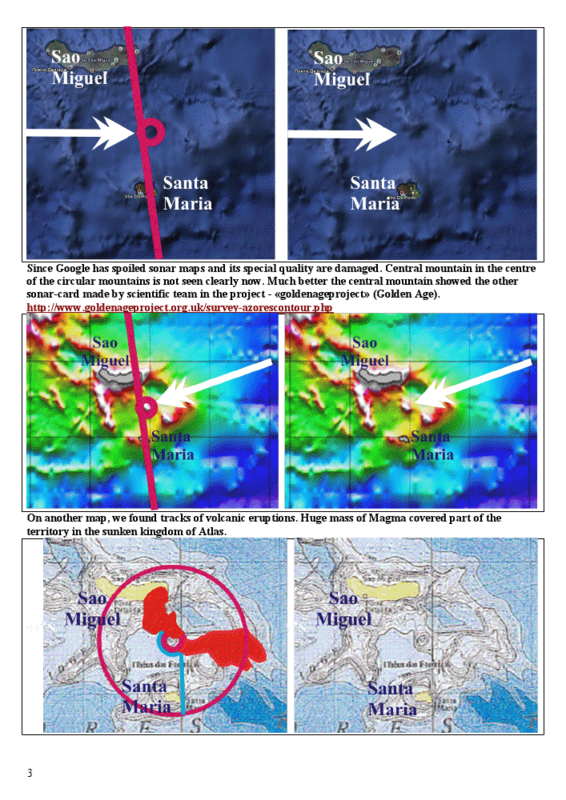 Far more important is the basaltic outflow that is mapped and massive. We get the picture of a subsiding island structure that is quite huge along with massive undersea basaltic volcanism. It is also clear that an uplift here could easily been hundreds of miles across. The pumice float from all this is recent and has been dated somewhat although I suspect it is far from precise as yet. Pumice debris has been found in northern waters that date from 4000 years ago to 6,000 years ago according to one paper I came across. That coincides well with my expected window of activity although the critical catastrophic event appears to have taken place around 1159 BC. However this critical event has been blamed on Hecla alone. Yet the 1159 BC event could easily have followed thousands of years of basaltic out flows similar to Hawaii. The subsidence event could easily have been a final dénouement. Hecla itself interior to the coast and is an unlikely source of pumice. The main event was the subsidence itself and this likely occurred in discrete events first perhaps with Lyonese and later with Poseidia on which Atlantis was established. The volcanism was integral to both Iceland and the region about Atlantis itself and was ongoing the same as many other locales globally. As previously posted, the emergence of a global thalocracy was clearly an event triggered by the Great Pyramid. Conforming dates all effectively go live at this time. I suspect efforts to trace things much before 2440 BC appear badly misplaced. Societies existed but were barely communicating as no economic driver existed. The discovery of so-called "Supervolcanoes" all over the world leads to interesting concepts regarding Atlantis in the Azores, right where Plato said that it was in his writings. Of course, the story has been embellished over the 10,000 or so years ago it was said to exist. However, there is no way to exaggerate the mass extinctions around the world at approximately that time. DNA "bottlenecks" in species can tell a biological story because some species did become extinct. Those that were left over will suffer from a decrease in the varance of DNA within their species. This is a fascinating subject since the ruins of Troy was found right where it was said by legend to exist. There will be no ruins from Atlantis if a volcanic eruption, earthquakes and sinking to the floor of the Atlantic Ocean is how how it ended. The fact that an oral tradition exists in addition to Plato's writings shows that there is a distant memory within the human species that continues until this day. I'd like to discuss this further with you sometime. Following the hypothesis that the Azores area exists over a supervolcano I found research that draws the conclusion that the Azores caldera exhibits the same structures under water that exists in Toba in the Pacific and others. The descriptions drawn from the results of P-wave tomographic studies describes magma resulting from lithospheric friction as well as magma plumes. This supports the hypothesis that indeed an underwater volcano exists at the Azores Plateau that is indeed capable of an eruption of VEI 8. As time permits I will continue to work on the hypothesis that Atlantis existed in the Azores as Plato's writing indicated. I will support this hypothesis with scholarly research.